The 860 PRO comes in a small black and yellow box. While there aren't a lot of details on the front, the back of the box advertises some of the drive's key features including its V-NAND technology and 3 year warranty. Inside, you'll find the SSD as well as a small installation guide and warranty statement. Like Samsung's other 2.5-inch SSDs, the 860 QVO is very well constructed. The drive's outer casing is made entirely out of aluminum and is very strong and lightweight. Instead of the black and red color scheme found on the 860 PRO, the 860 QVO is dark gray in color. The Samsung logo and square have also been "blacked out", which adds to the drive's already stealthy look. Like the 860 EVO and 860 PRO, the 860 QVO uses Samsung's new MJX controller. The company hasn't provided a lot of specifics regarding the controller's technical specs. However, they have stated that in addition to providing faster communication with the host system, the MJX provides much wider compatibility with other devices. This includes improved queued trim which enhances Linux compatibility. 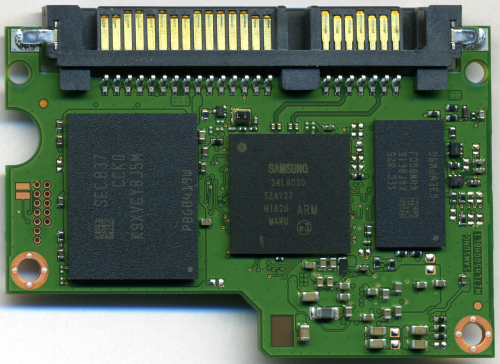 For the 1TB version of the 860 QVO, Samsung used their own 4-bit MLC V-NAND flash chips. 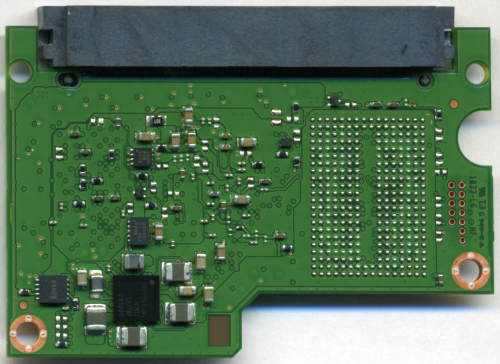 Looking at the pictures above, you can see that there is a single 1TB NAND flash package on the top of the PCB. The drive also has a 1GB LPDDR4 DRAM memory chip that is used for caching.